Direct level measurement is simple, almost straightforward and economical; it uses a direct measurement of the distance (usually height) from the datum line, and used primarily for local indication. It is not easily adopted to signal transmission techniques for remote indication or control. Though crude as this methods seems, it is accurate to about 0.1% with ranges up to about 20 feet. Although the dipstick and lead line method of level measurement are unrivalled in accuracy, reliability, and dependability, there are drawbacks to this technique. First, it requires an action to be performed, thus causing the operator to interrupt his duty to carry out this measurement. There cannot be a continuous representation of the process measurement. Another limitation to this measuring principle is the inability to successfully and conveniently measures level values in pressurised vessels. These disadvantages limit the effectiveness of these means of visual level measurement. Another simple method is called sight glass (or level glass). It is quite straightforward in use; the level in the glass seeks the same position as the level in the tanks. It provides a continuous visual indication of liquid level in a process vessel or a small tank and are more convenient than dip stick, dip rod and manual gauging tapes. Sight glass A is more suitable for gauging an open tank. A metal ball normal used in the tube to prevent the fluid from flowing out of the gauge. Tubular glass of this sort is available in lengths up to 70 inches and for pressure up to 600 psi. It is now seldom used. 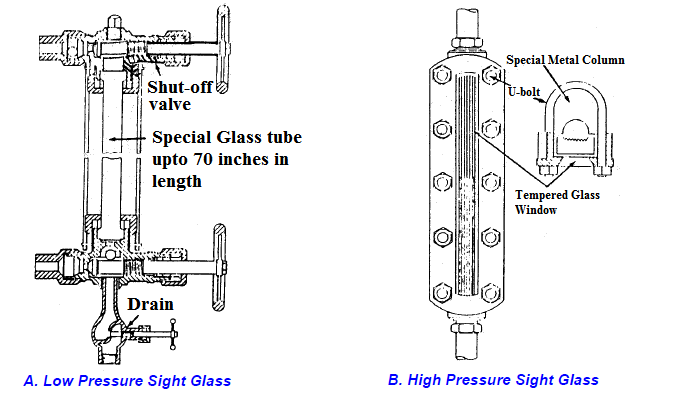 The closed tank sight glass B, sometimes called a ‘reflex glass’, is used in many pressurized and atmospheric processes. The greatest use is in pressurised vessel such as boiler drums, evaporators, condensers, stills, tanks, distillation columns, and other such applications. The length of reflex glass gauges ranges from a few inches or eight feet, but like the tube type gauges, they can be gauge together to provide nearly any length of level measurement. The simplicity and reliability of gauge type level measurement results in the use of such devices for local indication. When level transmitters fail or must be out of service for maintenance, or during times of power failure, this method allow the process be measured and controlled by manual means. However, glass elements can get dirty and are susceptible to breakage thus presenting a safety hazard especially when hot, corrosive or flammable liquids are being handled. The visual means of level measurement previously discussed are rivaled in simplicity and dependability by float type measurement devices. Many forms of float type instruments are available, but each uses the principle of a buoyant element that floats on the surface of the liquid and changes position as the liquid level varies. 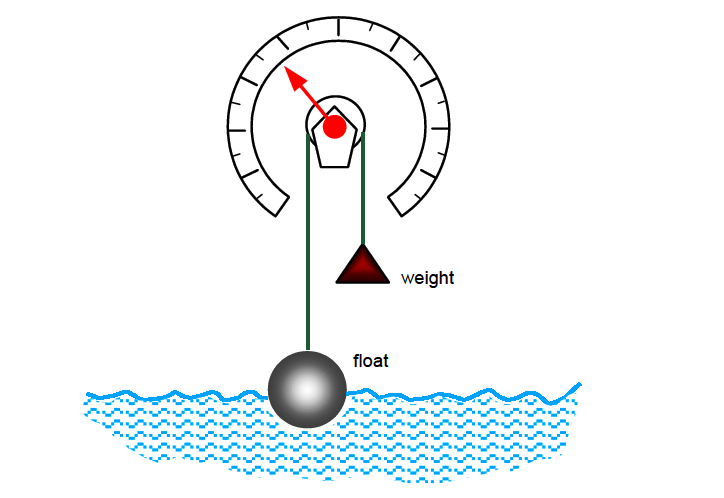 The float is connected to a pulley by a chain or a flexible cable and the rotating member of the pulley is in turn connected to an indicating device with measurement graduation. As can be seen, as the float moves upward, the counterweight keeps the cable tight and the indicator moves along the circular scale. Indirect or inferred methods of level measurement depend on the material having a physical property which can be measured and related to level. Many physical and electrical properties have been used for this purpose and are well suited to producing proportional output signals for remote transmission. This method employs even the very latest technology in its measurement. the force produced by a submerged body which is equal to the weight of the fluid it displaces. the force or weight produced by the height of the liquid. materials to be measured reflect or affect in a detectable manner high frequency sound signals generated at appropriate locations near the measured material. similar to ultrasonic but uses microwave instead of ultrasonic beam. at desired points of level detection, the material to be measured conducts (or ceases to conduct) electricity between two fixed probe locations or between a probe and vessel wall. the material to be measured serves as a variable dielectric between two fixed capacitor plates. In reality, there are two substances which form the dielectric -the material whose measurement is desired and the vapor space above it. The total dielectric value change as the amount of one material increases while the other decreases. the material measured absorbs radiated energy. As in the capacitance method, vapor space above the measured material also has an absorbing characteristics, but the difference in absorption between the two is great enough that the measurement can be related quite accurately to measured material. the force due to weight can be related very closely to level when its density is constant. Variable concentrations components or temperature variations present difficulties, however. Pressure of the measured material squeezes two narrowly separated conductor together, reducing overall circuit resistance in an amount proportional to level. “time-of-flight”, electrical pulses launch and travels back in frequency directly proportional to the level of the liquid.